El Nido, Palawan is a pristine, exotic island destination in the Philippines that can be reached by air, van, bus, or ferry. It’s not hard to get to El Nido, but there are a lot of different options so the process can be a bit confusing. There are also some old pages floating around out there with conflicting or outdated info. Hopefully this post clears some things up! The easiest, fastest, and most expensive (but recommended) way to get to El Nido is one of the direct flights sold by AirSWIFT. AirSWIFT is a boutique airline that owns and runs the El Nido airport (ENI) as a private airport, so it’s the only airline company you can fly with to El Nido. It’s a bit strange how that works, but at least it simplifies things! 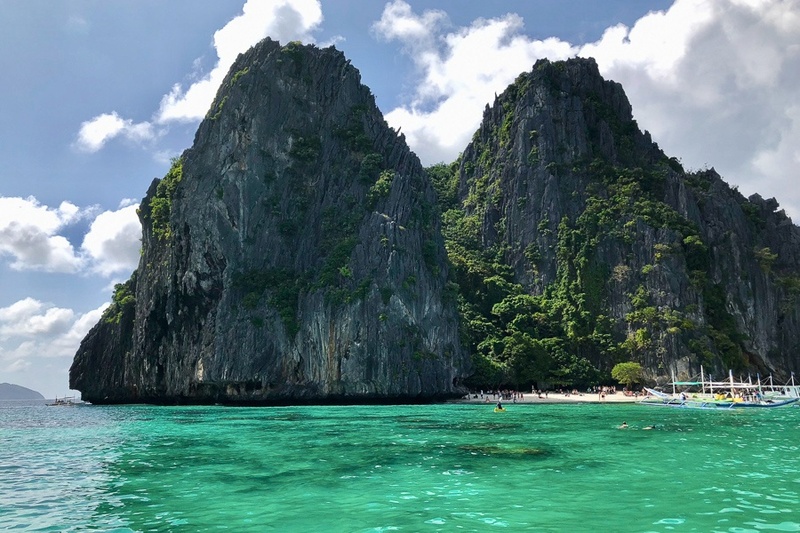 The El Nido airport, also called Lio Airport, is located just 2.5 miles (4 km) from El Nido town, and the drive from the airport to town takes about 20 minutes. When you arrive at the airport, there will be motor tricycle drivers waiting to transfer you to town, or your hotel can arrange a pickup for you if you ask them. The second way to reach El Nido is by taking a van from Puerto Princesa. This is one of the most popular ways to get there. You can reach the Puerto Princesa Airport (PPS) by taking a flight from Manila (MNL) or Cebu (CEB). Vans are waiting at the PPS airport and go daily to El Nido, or some companies can arrange to pick you up at a hotel in PPS. From Puerto Princesa, the drive to El Nido covers about 170 miles (270 km). It takes 5-6 hours by van and costs 875 PHP ($16.50) per person. The third option to get to El Nido is to take a bus from Puerto Princesa. As above, you can reach the Puerto Princesa International Airport (PPS) by taking a flight from Manila (MNL) or Cebu (CEB). From the PPS airport, the bus terminal is 2.5 miles (4 km) away, so you will need to pay a tricycle driver to transfer you there. The two bus companies are Cherry Bus and RoRo Bus. The bus drive from Puerto Princesa to El Nido takes 6-8 hours, and costs 500 PHP ($9.50 USD) per person. You may want to visit both Coron and El Nido on the same trip, in which case taking a ferry to El Nido can make sense. There are two companies running a ferry route between Coron and El Nido — Montenegro Shipping Lines and Phimal Fast Ferry. The price for the Phimal Fast Ferry is 1,850 PHP ($35 USD) and the journey takes 3-4 hours. You can also take a ferry from Manila to El Nido, but that journey takes almost 2 full days, depending on the weather and sea conditions. Not recommended unless you’re desperate! I’ve not previously heard of El Nido, but the Philippines is on my radar as they are growing some great cocoa there. Thanks for connecting and enabling me to discover your blog. Sure thing, thanks Doreen! I hope you do get a chance to check out the Philippines sometime, and especially El Nido!